Ok, so you have eight effects pedals which you use regularly. You use various combinations of these pedals in various songs, but you are not good at tap dancing.. or you are just clumsy and have (once or twice) stepped on the ultra tricked out-metalized-distortion pedal for the lead in your one ABBA cover. You have seen the digital effects controllers they use on the big stages, and have secretly yearned for one...even though you may never make the big stage. 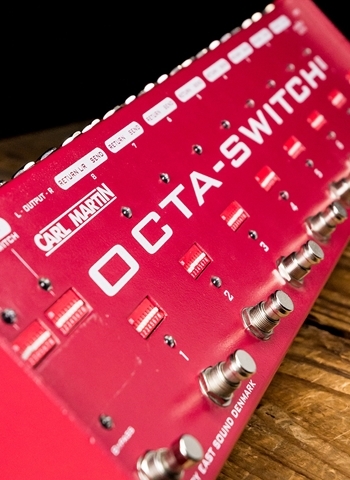 Enter Thomas Guldmann’s Octa-switch II. Your eight effects plug into the eight effects-loops on the back of this unit (all true-bypass, impedance free, gold relays so you can run any of your pedals, new and old without problem), and then by turning on or off the numbered switches in each of eight DIP Bank switches, you determine which effects you wish to use simultaneously in each Bank. There is a blue LED for every effects loop used and for each Bank (so once you are programmed, when you step on Bank 6 you will see the lights of all the effects you have assigned to Bank 6 and the Bank 6 LED). The Octa-switch II has incorporated a couple new features as well! The ninth switch on the left side of the case is a BYPASS Switch.. this allows you to completely bypass all eight pedals and enjoy only the unaffected sound of your amplifier. There are also two External Switching jacks which allow you to use two amplifiers and/or switch channels on those amps. Once you have all the Banks programmed, we recommend placing a piece of scotch or electrical tape over each DIP (..just to protect the switch from accidental switching, damage or floods...like beer). There is a buffered (or not...switchable) Mono input and a stereo Output, and the unit is powered by dual 9v batteries, or by a regulated power supply.. like the Big John or the Pro Power (both by Carl Martin). Please note, the DIP switches are slide type, NOT push down. They are easily operated with a small screwdriver, a pen, or a very very small finger. There is a buffered or True Bypass (non-buffered) switch at the back of the Octa-switch which you select depending on the stage set-up or your personal preference. On large stages when running long connected cables, there is a definite drop in the high end of your guitar sound (more or less depending on the input impedance of your amplifier). The solution according to Thomas was once again 'simple'. He built in a buffer circuit at the input, so the user can choose between 100% true bypass, or, a buffered bypass to 'beef' up the signal. The Octaswitch has stereo outputs as well as the stereo return on Loop 8 (this is a stereo jack with tip-left and ring-right). Since stereo effects like choruses are placed at the end of your effects-chain, we would typically insert them in Loop 8. The Octa-Switch has nine switches, the eight are presets and the ninth is an effect Bypass, which will bypass the Octa-switch to your un-affected amplifier sound. Please note if the Buffered Input is engaged at the back of the pedal, it will also be engaged in the bypass Mode on top of the pedal, as they work in conjunction with each other. Similarly, if the True Bypass Input is engaged at the back, the Bypass switch on top will switch to a True Bypass signal. The Octa-Switch has two external switching jacks for changing channels on your amp(s), or other operational features.